~Frankincense, Myrrh, Vanilla Sandalwood made with Biblical ingredients of Goats Milk & Olive Oil soap layers scented with Frankincense, Myrrh, Vanilla Sandalwood & sparkling with gold mica powders fit for a king. ~Layered soaps scented with Amber & Musk fragrances, colored with turmeric & glowing with suspended mica powders & a metallic dusting. 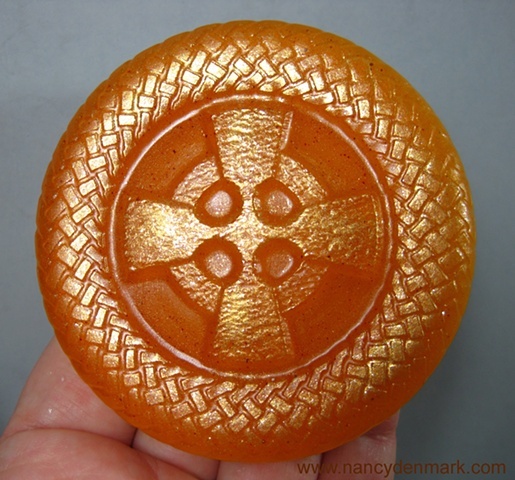 ~Honey Almond Orange Celtic Cross Round ~ layered soaps scented with Orange essential oil & Honey Almond fragrance, sparkling with gold oxide powders fit for a king. ~Lavender Sandalwood Vanilla, Very nice scent combo. Transparent soap on top layer and goat's milk soap on bottom layer with chamomile and lavender botanicals suspended in the bottom layer. Sparklies in the clear top layer with a surface dusting of metallic powders. ~Grapefruit ~ my new personal favorite is grapefruit! it makes a gorgeous full transparent ruby red grapefruit color bar or can be layered with the transparent on top of goat's milk.